Description: This variegated form of Tanika® Lomandra is beautiful and soft with small yellow flowers from April to October. 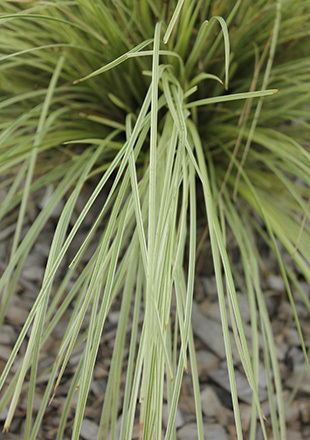 Variegated Tanika™ Lomandra has lightly coloured foliage that provides great contrast to green plants. 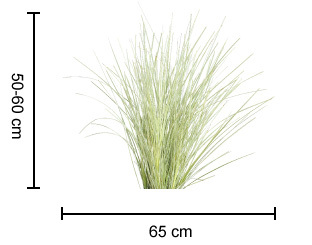 It’s tough like Tanika® Lomandra, but will need a little more pruning due to it’s variegated foliage and it performs better when protected from hot dry winds. Uses: For garden plantings and maintained landscapes. Position: Handles full sun but prefers light to moderate shade. Tolerates drought and frost. 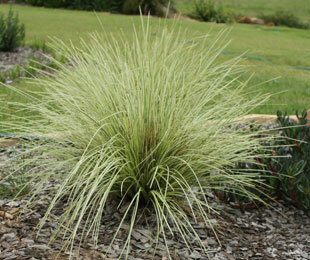 Variegated Tanika™ Lomandra suits sandy to well drained clay soils. Avoid wet feet. Care: Water as required for 8-13 weeks until established. Plant in a well mulched garden (chunky mulch is recommended). Ensure crown or base of plant is not below soil or mulch level. Use slow release fertiliser in spring every 1-2 years. Trim to remove discoloured leaves as required. Every 1-3 years cut back 15cm above the ground (will look better with pruning every year, this depends on your requirements). For more detailed information on Variegated Tanika™ click here.